An FTP client is a web hosted program that enables you to connect using FTP (file transfer protocol). Both Windows and Mac OS X have built-in FTP clients, which are useable if you have something quick and simple to do, but are not very feature-rich. You ideally want to install a program specifically designed as a dedicated FTP client. For Windows, free clients such as FileZilla or Free FTP from CoffeeCup do the job very well. Alternatively, you can go for commercial products such as CuteFTP or CoffeeCup’s Direct FTP. For the Mac, free clients Cyberduck and FileZilla are both quite popular. Commercial clients include Transmit by Coda and YummyFTP from YummySoftware.com. Although FileZilla is one of the most popular free FTP clients, it has one major problem: It stores your passwords in a plain text file. This means that hackers can navigate to that file on your computer and can easily read your FTP usernames and passwords if they are stored there. The simple way around this issue is to not use FileZilla’s built-in facility for remembering your password. In your browser, go to FileZilla. Be sure to download the client and not the server; the two are quite different. Select the appropriate download for your computer. You can download a FileZilla version for Windows, Linux, and Mac, with variants depending on the hardware you use. If you use Windows, there is also the choice between a zip file and a self-installer. Unless you know you need the zip file, select the installer. Click on the downloaded file to install the client on your computer. For full details on how to install FileZilla on your operating system, go to http://wiki.filezilla-project.org/Client_Installation. Open your FTP client and you are prompted to enter your server login details. Your server name (sometimes called the host or hostname). The port number your server uses. Unless your host has told you to use a different port, the port should be 21. 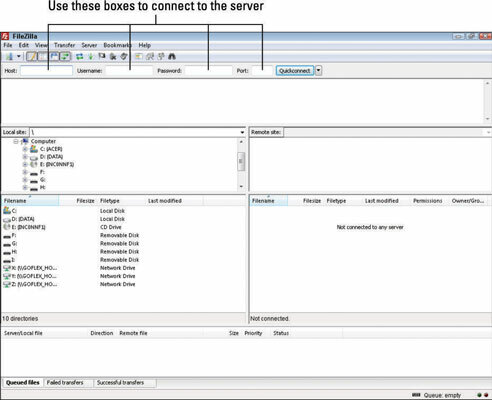 Click Connect and the client starts to negotiate a connection with the server. 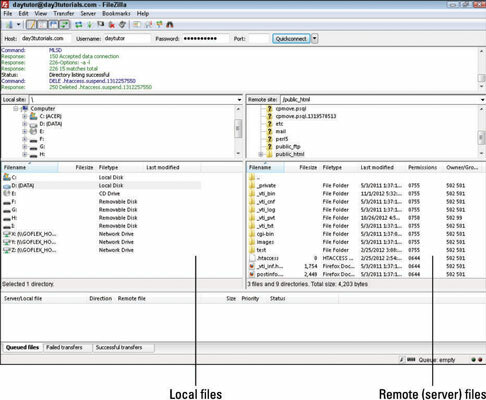 After the connection is made, you see a list of files and folders that are available on the server. You can use the client to copy, move, delete, and create files and folders just like you can with the file manager on your computer. Uploading files to the server is as simple as selecting the files you want to upload from the local column (the one on the left) and dragging them with your mouse over to the remote server column. Dragging files from the remote column to the local column copies those files to your local machine.